It was in a summer in the mid 70's I believe that we first drove to this historic fly fishing area of western Maine. The area has numerous lakes and rivers of fame, locations I have fished many times. Its waters are home to landlocked salmon and beautiful brook trout, and to the fly they will respond. This is one special place in the area that means so much to me. It is Upperdam. This is where the waters of Mooselookmeguntic rush into Richardson Lake. At the outflw there is a large pool formed and its home to some large salmon and brook trout. This is also the area where the Gray Ghost was first tied and fished. Along with the Gray Ghost it is also the birth place of many beautiful streamer flies. In the next few years there will be some upgrades to this dam and may perhaps change it forever. This is it as I will remember it. I purchased this guide a few weeks ago, because of my interest in Southern trout flies. When I recieved it and opened it up I was very impressed with how well its written. It lists the traditional patterns, with full color photographs of the flies in detail,along with a brief on their history. While its not a how to tie book its detail photos of the flies is sufficient enough to tie from, even for me. I'm of the belief that a picture is worth a 1001 words. At a 19.95 price its worth the investment. And these are a classic treat this time of year.... soon to be roasted chestnuts. Those of you who have never tried these, please do.... I'll leave it at that. 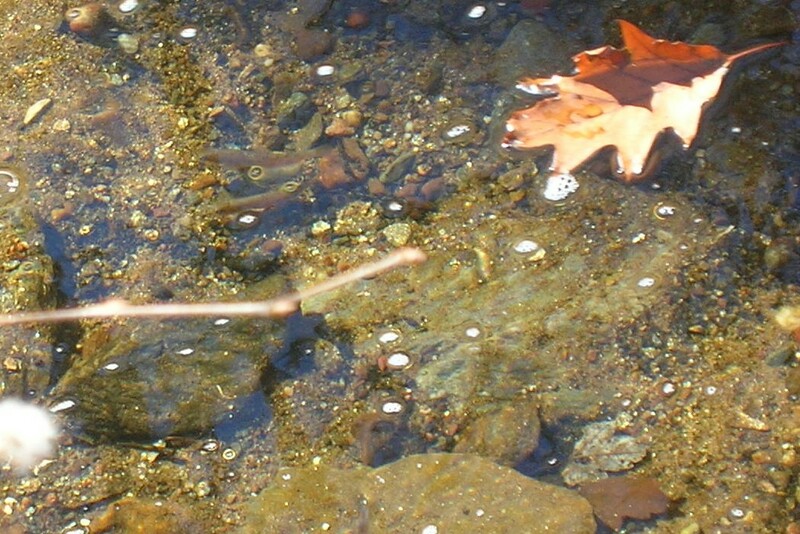 A small stream on this November day, crisp, clear and full of wild brookies. I believe that most of the spawning has taken place just by the way these trout were attacking the fly being offered, attempting to feed heavy before the winter sets in. I fished a Royal Wulff and they were very aggressive as the fly moved along the runs and into the pools. I love fishing this time of year. A beautiful sight along the stream, Christmas Ferns, their bright green pushing through the dead leaves. This pool brought several brookies up to the surface, as the Royal Wulff drifted by. A few jewels from this November stream. This is another post on some of the local flavors in my neck of the woods. Martin Rosol's has been making quality meat products in New Britain CT. since 1929. They make the best natural casing franks, and their kielbasa is second to none. I have been enjoying these since I was a kid, so many years ago. One of the special qualities of this company and its products is that they in all of the years of making their products is they have never lowarded the standard of quality. This is one of my favorite way's to enjoy it. Grilled and sliced kielbasa, potato pancakes, sauerkraut, and pumpernickle. Old stone walls and colonial homes are parts of American history I enjoy. This weekend my wife and I did some walking in an area of Connecticut that had both. Its in an area that also has a trout stream that was on a list of streams to fish. We drove to the stream on Saturday, parked the car and were soon into the woods and fields along the water. 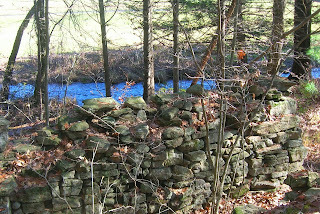 We came upon a stone wall that had been there for a long time, broken down and moss covered. While standing there gazing, thoughts of why it was constructed in the first place went through my mind. Was it for property lines, for keeping in livestock, perhaps a garden, or was it for what I like to belive a line of defense during the American Revolution. Later in the day the age of the wall was revealed, by the sight of an old colonial saltbox home.So its possible the stone wall was used for all of the above. A beautiful Connecticut saltbox house, perhaps built in the time of the American Revolution. A woodland trout stream, that proved to be a challenge. Once the right fly was selected, a few hookups came, but the fish to hand were limited. It's an area we both enjoyed, for the history, beauty of the countryside, and the stream....... We'll be back there again. Lots of good things taking place in the last few days. I walked a stream and was rewarded with some of natures autumn rites. 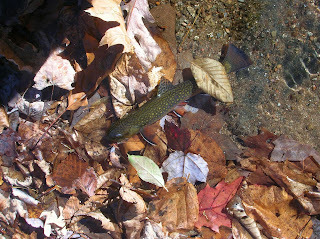 I observed many pairs of spawning brookies, and even managed to photograph a couple. I also fished a Royal Coachman dry fly and had a few brookies rise to this beautiful fly. I was able to bring one or two to hand. And with Halloween, came to carving of the pumpkin and that means roasted pumpkin seeds. A great treat.